Though carl benz and gottlieb daimler, who built the worlds first practical motor car between 1885 and 1886 and whose companies merged in 1926 to form the daimler-benz firm, lived only sixty miles apart, the two never met! benz patented the original joint effort in 1886 and sold his first production vehicle the following year. Top speed of 12 mph engine typedrivetrain: Water-cooled, horizontal single-cylinder displacement 1,050 cc (1.05 l) power rating 1.5 hp transmission 2-speed belt drive chassis: Iron-reinforced wooden frame; Front and rear suspension by full-elliptic leaf springs; 2-wheel spoon brakes acting on solid rubber tires; 616 lbs. First four-wheelers benzs first cars were three-wheelers, but they sold poorly. In 1892, he brought his first four-wheeler, the viktoria, which was constructed in several forms that varied according to engine power and number of seats. In 1894, purchases of 67 viktorias virtually equalled sales for the entire period between 1886 and 1893- but it was the little velociped of 1894 that heralded the future. Lighter and cheaper than the viktoria, it sealed benzs success. sales! sales of the velociped were phenomenal: 135 velos were sold in 1895 and 181 in 1896 more than the combined efforts of all the worlds other carmakers. Despite its name, the velo was a true automobile, capable of carrying two people over long distances, and the design was widely copied by other manufacturers. In nine years, benz sold some 1,200 examples of the basic velo design. During the same period, the velos power rating was boosted from 1.5 to 3-5 hp. 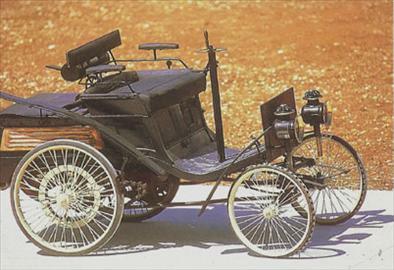 The benz velociped was a true horseless carriage with a two-speed belt drive and electric ignition.